In an attempt to summarize nearly two years of research this lengthy post shares my recommendations for interim solutions and key findings on lid design, funding, and management. I first posted about this in February 2014 and again in July of that year. But I’m not the first to bring up the idea; even before the freeway was built in the 1960s, the First Hill Improvement Association and local architects Paul Thiry and Victor Steinbrueck fought for concurrent improvements like lid parks and rapid transit. Eventually I-5 was partially lidded using construction techniques similar to highway bridges (steel trusses and concrete beams), starting with Freeway Park and later the Washington State Convention Center. More recently I’ve met with a number of community members, including architects and real estate professionals, who have been thinking about lidding more of I-5 over the past few years. Since the last post I’ve greatly refined my own proposal, and in June 2015 I completed my graduate thesis on the topic (I earned a Master of Urban Planning from the University of Washington). My research sought to answer how freeway lids should be built over Interstate 5 in Downtown Seattle between Madison Street and Olive Way. I’ve assembled a trove of data on completed and planned lids across the United States, done a rough cost estimate, performed a site analysis, and written case studies that offer important lessons for design. Here I present my findings and call upon local leaders to move towards implementation. Seattle is greeting new residents at a rate not seen since the gold rush of the early 1900s. The city is growing with thousands of new residents and jobs every year. Construction cranes and gleaming new towers are dotting the skyline. These rapid changes are bringing as many opportunities as they are challenges, not the least of which are crowded schools, slow buses, and skyrocketing rents. With an influx of new people comes a greater need for urban infrastructure, and this article argues that one of the key pieces of that needed infrastructure is municipal parks that can provide a multitude of benefits. The Center City (the Downtown, First Hill/Capitol Hill, South Lake Union, and Uptown urban centers) is now so intensely developed that there are few vacant sites left for new buildings. But growth will continue for the foreseeable future, and the unused airspace over Interstate 5 will inevitably beckon developers and city planners. My assumption is that the freeway will eventually be lidded, so I started by researching what the new artificial land should be used for. I found that using lids to create public parks is the most beneficial option for the city. According to a gap analysis by the Seattle Parks and Recreation Department, the Center City has a 9.56 acre shortage of “useable public open space” (defined as at least 10,000 square feet). Breaking this down further by the nine smaller urban villages in the Center City, and accounting for the department’s jobs-related goal, I determined five urban villages have a larger deficit totaling 13.08 acres. 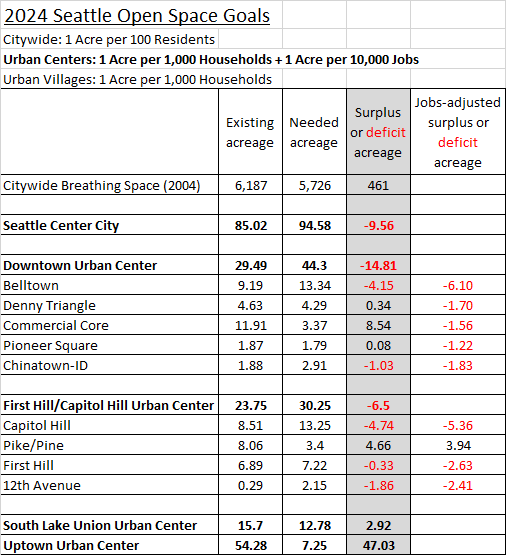 Based on the Seattle 2035 Development Capacity Report (PDF), the First Hill/Capitol Hill urban center also has an employment capacity deficit of about 800 jobs; however, most of that is likely to be covered by the independent master plans of local colleges and hospitals. Still, it has become clear that lids could support some job growth in the retail sector while simultaneously ensuring the new parks are well used and generate their own maintenance funding. Seattle already has a number of commercial services in its parks, like the snack shack at Golden Gardens and boat rentals at Green Lake. I’ve generally recommended against other uses for lids. In my original proposal I shared a conceptual rendering with office towers and apartment buildings on top of the freeway, but the cost and technical complexity likely dampen the reality of that idea. I did find one example of apartments built above a freeway in Manhattan; The New York Times chronicled the significant problems with noise, vibration, and fume that residents experience. If a future analysis concludes that housing, especially for low-income residents, is considered a viable option for lids, measures will need to be taken to ensure that residents are offered a high quality of life. Office uses beyond space for management staff are not ideal because they wouldn’t generate nearly as much foot traffic as retail activities can. Lids could possibly host some civic uses, like a community center, museum, or a small extension of the Seattle Public Library. Existing civic examples include other convention centers in Kansas City and Detroit and municipal buildings like the city hall for Fall River, Massachusetts. Lids should absolutely not be used to provide any public parking, of which there are several examples. The much higher cost is not justified when there is so much parking in Downtown already, and building more infrastructure for cars opposes the purpose of building lids in the first place. With the failing search for a downtown elementary school site I considered if one could be built above the freeway. But it’s not a good solution for several reasons. Pollution from major roadways is considered harmful within 500 feet, and children are particularly susceptible. Whether Seattle’s other schools located near I-5 have lower air quality has been a matter of debate in recent years. The site would also be inflexible and the building would likely cost more than normal due to increased engineering needs. Through all of this it has become clear that the ideal design of future lids in Downtown should primarily include park space with a variety of modern amenities, and secondarily provide space for indoor and outdoor retail uses. Ideal tenants would be restaurants, bars, coffee shops, art galleries, small grocery stores, and similar businesses that can use small spaces. This has the highest potential to improve the quality of living in the Center City, create better environmental conditions, and generate an economic return on the public’s investment. Unlike many major U.S. cities (New York, Chicago, Boston, Denver, and Portland to name a few), Seattle has no identifiable central park. Smaller open spaces like Westlake Park and the waterfront piers are great contributors to Downtown life and should be cherished. But big public spaces like Chicago’s Millenium Park and Portland’s South Park Blocks are also essential to city living because they provide a refuge from the urban environment while offering a wide variety of amenities and programming for all walks of life. 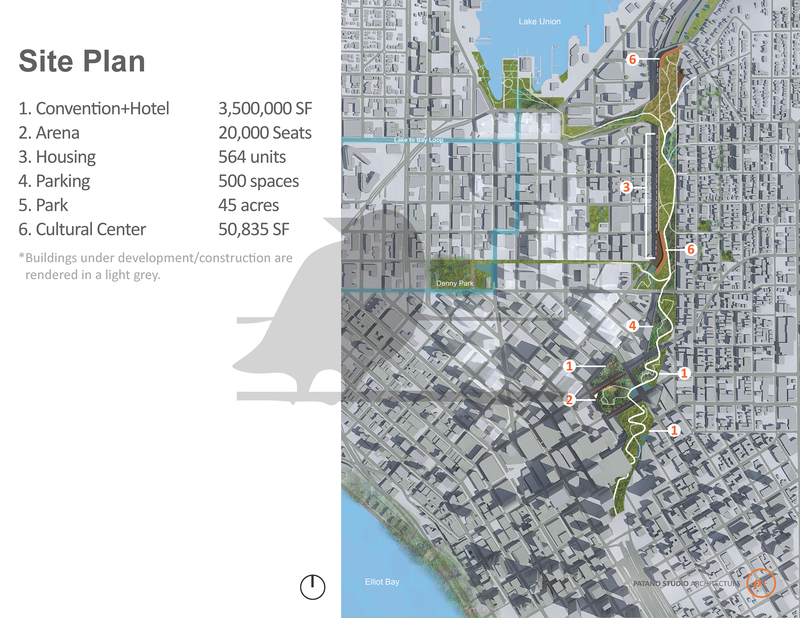 Establishing a large urban park in Downtown would be one of the most transformative capital projects in Seattle’s history, and there’s only one place it could go. The economic, environmental, and public health benefits of urban parks are also well documented. Parks improve quality of life by providing spaces for relaxing, exercising, and socializing. Proximity to parks boosts property values and attracts business, and people are more likely to use parks when they are located near their homes and jobs. Parks that are naturally landscaped capture air pollutants, filter rain water, reduce the urban heat island, create wildlife habitat, and improve the urban aesthetic. Additionally, the Washington State Convention Center (WSCC) is planning its third major expansion adjacent to Interstate 5. This is a shot to knit together neighborhoods which have been divided by a vehicular canyon for over 50 years. The $1 billion, 440,000 square foot facility is due to begin construction in 2017. A future post will cover the project in detail. The state Department of Transportation [WSDOT] says the 40-year-old pavement on Interstate 5 through Seattle and Shoreline — the busiest stretch of freeway in the state — has deteriorated so badly that it needs to be torn out and rebuilt. Not just resurfaced, but replaced. Not just the freeway’s skin, but its muscles and its bones…It could take decades to complete work on all 18 miles. Construction could affect traffic for years. Project director Maureen Sullivan says the project could cost $2 billion or more. The state legislature has never provided any funding to plan this megaproject, let alone carry it out. Within the next decade or two (or three) it will become an unavoidable issue. If local pressure fails to build lids anytime soon, I-5’s eventual reconstruction will provide the opening. Other infrastructure that can piggyback on the project are completion of the the HOV gap, pedestrian and bike trails, and perhaps even regional high-speed rail. Lids are also a matter of environmental justice in the Puget Sound region. On State Route 520 three new lids were recently built in the small and mostly single-family municipalities of Medina, Hunts Point, and Clyde Hill. According to U.S. Census data, the median household incomes in these cities are, respectively, about $180,000, $136,000, and $207,000. On Mercer Island, where two large lids were built in the 1990s, the median household income is $126,000. In Seattle the median household income is much lower, only $65,000. Yet even the existing lid in the Mount Baker neighborhood and two planned lids in the Montlake neighborhood mostly benefit outlying, low-density, and affluent neighborhoods. Additional Downtown lids will correct these regional imbalances by providing new park space for the many low-income and middle class people who live and work in Seattle. With a larger population and robust transit access, Downtown Seattle parks are accessible to many more people and can support more economic activity than the isolated parks over SR-520 and I-90 ever will. WSDOT has indulged the high-income suburbs and should now provide a similar level of public investment for the people of Seattle. My next step was to build a list of completed and proposed lid projects in the United States. To my knowledge I am the only researcher to have done this and this is the first publicly available database. I sought data on completion year (to adjust costs for inflation), original costs, and size. Most of the data was acquired through online sources or by contacting local and state officials. Significant gaps remain where, for various reasons, these officials did not have the information. A map of identified projects is embedded below (red dots are completed, green dots are proposed). If you have suggested additions or corrections you can contact me. The average cost of completed lid parks is $13.2 million per acre. Proposed lid parks have an average cost estimate of $25.1 million per acre, a number skewed higher by large unofficial proposals in Austin, Los Angeles, and Chicago. The average between completed and proposed projects is $19 million per acre, a number comparable to the latest project in Dallas which cost $21.5 million per acre. Locally, Seattle’s Freeway Park and the Aubrey Davis Lid on Mercer Island both cost about $18 million per acre. Contrast these numbers with the exorbitant estimates of two related studies. In a 2009 report (15 MB PDF) for the City of Seattle, engineering firm CH2MHill estimated lidding I-5 just between Spring Street and Madison Street (1.5 acres) would cost at least $70 million per acre. In a 2013 study (47 MB PDF) of the Convention Center expansion, architectural firm LMN estimated a 1.1 acre lid between Pike Street and Pine Street would cost $52 million per acre, and a 2.3 acre lid would cost $102 million per acre. These numbers are three to five times greater than real world examples. While Seattle certainly has unique challenges that may increase costs, these estimates are far removed from the reality of actual lid projects and should not be used moving forward. A conservative estimate, then, is that new lids in Downtown Seattle can be expected to cost $20-$25 million per acre. This can be compared to appraised land values to illustrate the minimum cost of an alternative method for creating any new downtown park: buying private land. I did a random, unscientific sampling of private properties near the study area. West of I-5, which is mostly zoned for skyscrapers, the average appraised value is $31 million per acre. Recent sales show that market values are even higher: the 4 acre Convention Place bus station sold for $147 million, or about $37 million per acre. In the east, zoned for mid-rise buildings, the average appraised value is $9 million per acre. The cost of lids would be much less than acquiring private property in the core of Downtown. And unlike traditional parks, lids would not remove any land from the local tax base, avoiding a drain on revenue for municipal services and infrastructure. This is especially important considering the high value of land in Downtown. Using lids to create large central park also avoids the dramatic and costly process of eminent domain. As discussed later on, I recommend lidding approximately 8.4 acres, resulting in a rough cost estimate of $168 to $210 million. That can be rounded up to $250 million to account for rebuilding retaining walls and overpasses, traffic system modifications, and improvements to Freeway Park. Paired with the massive benefits of freeway lids, and relative to the enormous megaprojects going on Seattle right now, a price tag of $250 million is an incredible bargain. Compare this cost to the Highway 520 rebuild ($4.6 billion), the Alaskan Way Viaduct replacement ($3.1 billion and counting), the University Link light rail extension ($1.9 billion), Waterfront Seattle ($1.1 billion), Seattle’s renewed transportation levy ($930 million), and even the City’s anticipated contribution to a proposed SoDo sports arena ($200 million). Lids in Downtown can easily be broken into phases; I’ve proposed building one section at a time between various street overpasses, starting with the smaller sections. Additionally, the funding options are many. Bonds, levies, and local improvement districts are local sources that have a history of voter support (e.g. the Seattle Park District, the $290 million waterfront seawall bond, and the $73 million Pike Place Market renovations levy). Federal transportation grants are competitive but a likely source for a project of this scale and impact. WSDOT and the Washington State legislature will also be interested because state right-of-way is involved, and at the very least the City of Seattle could be deeded the air rights at no cost. Seattle’s many corporate headquarters and wealthy residents also make philanthropy particularly promising; private donations funded 48 percent of Dallas’ new freeway lid. In short, funding a public project this moderate in scale for a city the size of Seattle is not an issue. The larger concern is how lids should be designed to best benefit the many needs of the public and fit into the built environment of Downtown. For that, I dove into the details of several other lid projects. 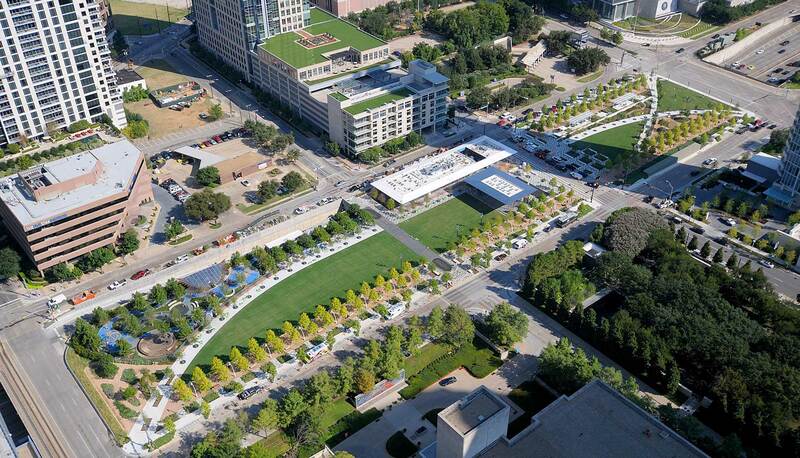 Klyde Warren Park is a 5.2 acre lid in downtown Dallas, Texas that opened in 2012 at a cost of $110 million. It spans over eight lanes of TX-366 for three city blocks. It was designed by landscape architecture firm OJB. Since opening the park has seen one million visitors a year, the surrounding blocks have experienced significant real estate investment, and in 2014 it won the Urban Land Institute’s award for urban open space. The park’s design and operations offers many lessons for future lid parks in Seattle, so last spring I visited Dallas to see its success firsthand. I also talked with Michael Gaffney, vice president of operations at the nonprofit Woodall Rodgers Park Foundation (the park is owned by the City of Dallas but managed by the Foundation). He provided extensive insight and I made a number of observations. Firstly, the park is flat and open and visitors can enter it from almost any point along its perimeter. These characteristics play a huge role in the park’s success by encouraging casual use at all times of day. Open sight lines, widely spaced trees, and well maintained landscaping allow people to see into and across the park, thereby promoting safety and security. All of this is enabled by utilizing a thin structural system, geo-foam, and trenches for trees. The design was also bold enough to alter the street grid and demolish a freeway overpass to create a more continuous and flexible space. The datum of that street was preserved, however, with a paved path that can be used by vehicles for emergencies, maintenance, and special events. The Dallas City Council has mused closing the remaining street that bisects the park. The park has ongoing family-friendly programming and features. Concerts, markets, athletic races, and other events are scheduled throughout the year to make good use of the park. Additionally, the park has many features that attract a variety of users. There is a modern children’s play area, water fountains, an off-leash dog pen, an outdoor reading room, ping pong tables and mini-golf, and wide lawns. The outdoor seating is plentiful and mobile rather than fixed. The entire park is wheelchair accessible. 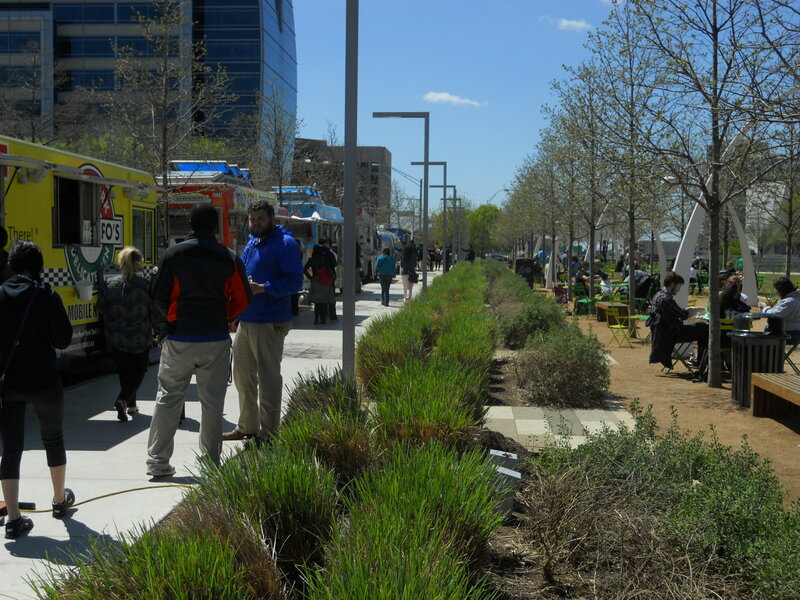 Klyden Warren Park also showcases how commercialization of public space works for the benefit of the public. A restaurant and burger kiosk built onto the lid draw visitors all day and generate funding for maintenance and operations. In another win-win relationship, the Foundation schedules a rotating roster of food trucks to park on the perimeter. The park also gets funding from three local improvement districts. The park’s $3 million annual budget is managed by a specialized entity that can dedicate time and resources to ensure its success for downtown Dallas. The Woodall Rodgers Park Foundation has event planners, custodians, security staff, and others who manage the park on a daily basis. Along with high foot traffic and good design, the park’s visible staffing helps discourage nuisance activities and ensures litter never piles up. The Foundation’s office is also directly across the street from the park, allowing quick access by staff. Future lids in Seattle should follow the successful example of Klyde Warren Park. Along with enabling economic activity and a clear design strategy, perhaps the most important finding is that a nonprofit or a dedicated City office needs to manage lid parks on a daily basis. This recommendation is not unique to parks built over freeways and is becoming more common across the country, but the unique nature of freeway lids merits a different approach. The management entity would be similar to Friends of Waterfront Seattle and could be an evolution of the Freeway Park Association. or the Metropolitan Improvement District. The proposed Montlake Lid in Seattle’s Montlake neighborhood is designed to mitigate the impacts of the SR-520 widening, a $4.6 billion megaproject that includes adding HOV lanes to the freeway, rebuilding the floating bridge across Lake Washington, and rebuilding the Portage Bay Bridge that connects to Interstate 5. Located in a single-family residential area, this lid has a much different context than either Freeway Park or Klyde Warren Park. However its design process still offers lessons for future lids in Downtown. Designed by VIA Architecture, the project’s theme is connecting the urban and natural environments. The original design proposed a 1,400 feet long lid stretching from Montlake Boulevard to the edge of Lake Washington. However, it was found that would impose large walls on the neighboring streets and require significant mechanical ventilation. After another round of public feedback in 2014 the design was shortened to 800 feet, and at the eastern end there will now be a pedestrian and bike bridge across the freeway. The 2015 concept design (22 MB PDF) shows five lid sections split by multiple roadways. One clear feature will be the relocation of the Montlake Freeway Station to the top of the lid and a transit ramp that will connect buses to the new HOV lanes. Otherwise the programming is mostly passive and little is emphasized in the concept design beyond multi-use trails and trees. Seattle Neighborhood Greenways is concerned that the plan for the lid and surrounding roadways does not adequately address pedestrian and bicycle mobility. The lid and land bridge will connect to a new bascule bridge over the nearby Montlake Cut waterway. They will also help reduce local noise and pollution. But otherwise the conceptual design leaves much to be desired for a major transportation node and urban neighborhood. It is unclear what impacts the lid will have on surrounding land uses, and whether any thought has been given to upzones that would facilitate better use of this public infrastructure. The lesson is that a clear vision of circulation and programming are needed early on in the design process. Philadelphia has two lid parks over Interstate 95 near its downtown riverfront. In the course of inventorying lid projects a local official could only tell me they were completed in 1976 and, together, they are approximately 5.2 acres in size. Because so little information was available I did not perform a formal case study. However, I had the good fortune to visit Philadelphia after graduating and was able to make some observations. Built the same year as Freeway Park, these lids were designed more in the flat, open style of Klyde Warren Park. The site plan provides opportunities to meander, sit, play, and explore. They are easily accessible from surrounding streets with clear, wide entryways. Vegetation is well managed and trees are widely spaced to enable views across the park. Active programming wasn’t obvious during my visit, but a variety of paved areas indicated the park spaces were flexible and could host many types of events. On both lids the freeway traffic below is not noticeable. In the south is the larger of the two structures. Foglietta Plaza sits between the Dock Street and Spruce Street overpasses (both overpasses are paved with cobblestones, calming traffic speeds). The plaza is surrounded by large trees and a grid of waist-high planters that enable views across the park. Ventilation stacks stand among trees to one side. Westward the plaza seamlessly connects to solid ground, where a Korean War memorial splits Front Street. To the east the plaza meets Columbus Boulevard at street level. In the southernmost area, across Spruce Street, is the Philadelphia Vietnam Veterans Memorial and a wide walking path. To the north is the smaller “I-95 Park” integrated with the Chestnut Street overpass. Along with lawns it features a dog run and an Irish immigrant memorial. However the park is accessible only on two sides because of a significant grade change; the eastern side faces Columbus Boulevard with a tall featureless wall. Due to this and other reasons, the nonprofit Delaware River Waterfront Corporation plans to demolish this lid and rebuild it as part of a larger $250 million project to improve public connections to to the river (see the video below). A feasibility study found the new lid can be sloped to provide a view of the river from Front Street. This example shows how freeway lids can fit into the urban street grid to promote pedestrian connections, mitigate the impacts of freeway traffic, and accommodate a mix of public spaces. The well maintained vegetation and variety of high-quality materials also promote visual interest and civic pride. The design of future lids in Seattle should consider similar opportunities to create an enjoyable park experience. 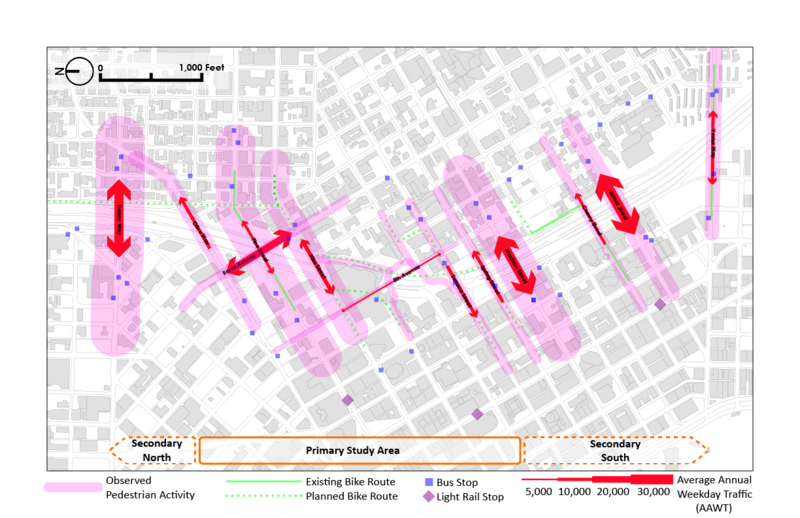 After the case studies the next step was a site analysis of the study area in Downtown Seattle. I reaffirmed the prime location between Olive Way and Madison Street, where Interstate 5 runs in a deep trench between the surrounding streets and buildings. I used the existing divisions of freeway airspace to parcel this area into sections numbered 1 through 6. At the suggestion of my faculty adviser I also expanded the scope into secondary study areas, which are north to Denny Way and south to Yesler Way. Because of their topographic situations I considered these areas in much less detail. Using public data and my own feet on the ground I documented characteristics like predominant land uses and landmarks, trees and vegetation, traffic volumes, noise, views, and the freeway’s configuration. King County’s topographical data and WSDOT engineering drawings were used to find the rough dimensions and slope of each study area. I determined the lid surfaces will need to be sloped or terraced due to grade changes between the sides of the freeway trench. I found no examples of similar challenges in the lid inventory, but there’s no reason it couldn’t be done as long as columns are able to be located within the medians. Lids will also facilitate a few beneficial changes to freeway ramps and city streets. 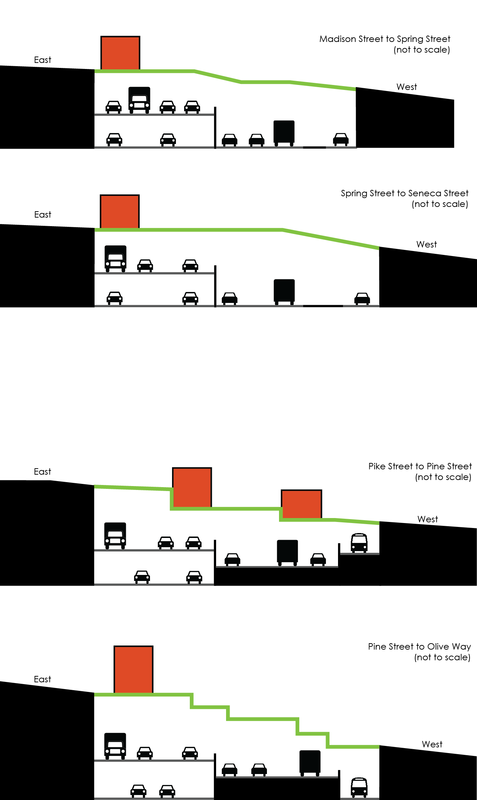 The Spring Street and Seneca Street ramps duplicate the functions of nearby ramps, for instance, and could be demolished to streamline east-west traffic flow and enable lids to completely cover the freeway airspace. Seneca Street and Olive Way can be converted to two-way traffic to create better vehicle and transit flows. Sidewalks and crosswalks need to be added in a few key locations where they are currently missing. In my thesis I proposed closing the Spring Street overpass to create a larger park space between Madison Street and Seneca Street. However, the Madison BRT project now appears to be set on using Spring Street for eastbound buses. Given this limitation, the overpass should be modified or rebuilt to be curbless and possibly even restricted to transit vehicles. From the site analysis I developed a number of solutions for improving the environment around I-5 in the short term. These simple steps will convert marginalized areas into pleasant and useful spaces while building public support for permanent freeway lids. First and foremost, one case study concluded that Freeway Park needs major upgrades and more civic attention. Despite its unique place in Seattle’s public realm it remains neglected by the city government and its citizens. This is partially due to a legacy of crime and inadequate maintenance since the 1980s, but also because the park is so hidden from the surrounding streets. The park’s design is also inflexible and offers little for visitors to do besides sit or stroll. Improvements in visibility and landscaping have been made, but today the park is still primarily used by a only a few select groups: First Hill residents who walk through it to work; nearby office workers who visit to smoke or have lunch; Convention Center visitors; those interested in summer programming like evening dances; and homeless people who find refuge in the park’s dangerous nooks and ledges. A revitalized Freeway Park would be more attractive to families, youth, tourists, and others who wouldn’t otherwise know about it. As the original freeway lid in Seattle, improving Freeway Park’s accessibility and programming will implant a more positive image of lids in Seattleite’s minds. A 2004 report by the Project for Public Spaces made a number of recommendations to improve the park, and I’ve stressed a few of them and added my own. Specifically, changes need to be made to the park’s surface structures and entrances. In the spirit of creating a unified pedestrian corridor above the freeway, new handicap-accessible ramps are needed at the Pike Street, Union Street, and University Street entries. Walls around all of the park’s entries need to be lowered and vegetation needs to be trimmed even further. Barriers need to be placed at the hidden ledges where people precariously camp over the freeway. More flexible seating, covered structures, food vending, and frequent daily programming are needed to draw more people into the park. A nonprofit or specialized public office needs to directly manage the park on a daily basis. Freeway Park also offers positive lessons for future lid design. Its blend of hard concrete and lush landscaping is an inspiring juxtaposition between the functionality of transportation infrastructure and the traditional design of municipal parks. And while its street entries need improvement, the park connects well with several surrounding buildings, providing direct pathways to the Union Square office towers, the Ceilo apartment tower, and the south side of the Convention Center. Similar connections need to be made with neighboring properties on future lids in the area, such as the Paramount Theater and the low-income Olive Tower. The city must reclaim the “dead spaces” along the freeway edge. There are a number of these linear and triangular spaces characterized by trash and overgrowth. They’re mostly fenced off, but these forgotten spaces are often inhabited by homeless people despite steep slopes, exposure to fumes and noise, and proximity to fast-moving freeway traffic. Interventions in these spaces can take the form of pocket parks, new pedestrian routes, noise walls, or even official tent encampments. They could also be leased or sold by the state for private development, with the revenue going to a dedicated fund for future lid construction. Similar to the needed improvements at Freeway Park, this interim step to future lids can also build political support for human uses of freeway spaces. This idea is planned for implementation in the south next to the Yesler Terrace public housing redevelopment. The Seattle Housing Authority wants to install temporary improvements like community gardens and dog runs in the strips of unused space on the east side of the freeway. Those dead spaces, along with the strip below Harborview Medical Center and a large King County-owned parcel on the west side of the freeway, could be positive changes in an area where lidding is less feasible. Another short term solution is to remove parking from the freeway overpasses. Parking on Pike Street, Seneca Street, Madison Street, and Yesler Way does not directly serve any residence or business. It’s also unnecessary in light of the glut of Downtown parking spaces. The parking lanes can be replaced by anything from protected bike lanes or widened sidewalks to parklets, landscaping, or public art. Bringing more people above the freeway will spur conversations about other improvements. Both interim and permanent solutions must integrate with other ongoing projects in the area. Broadly, the 2002 Blue Ring open space strategy includes a freeway lid among ideas for linking urban neighborhoods to Elliot Bay and Lake Union. As part of that,Waterfront Seattle promises to reshape the city’s connection to Puget Sound. 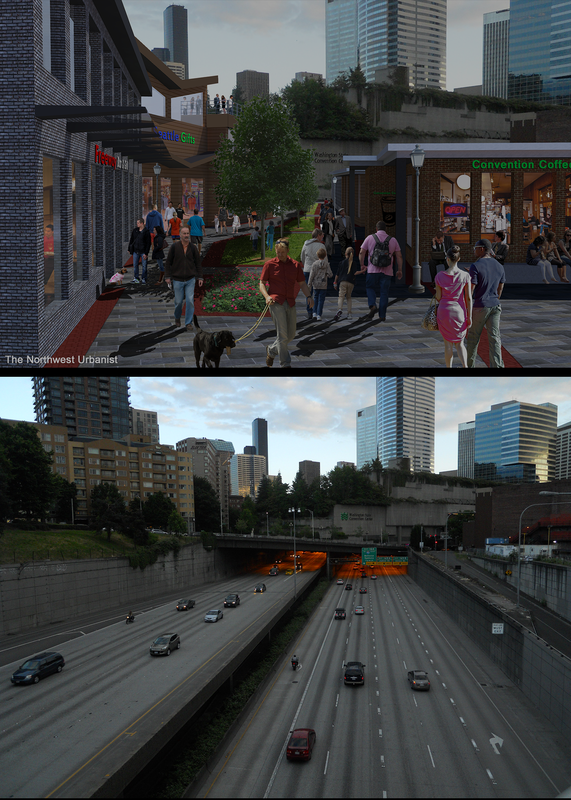 With the I-5 lids proposed only a few blocks away, the two projects can act as bookends to the Downtown public realm. Improvements on key streets should link these two projects, such as Pike Street and Pine Street. Indeed, the Pike-Pine Renaissance is a proposed plan to create a consistent streetscape between Pike Place Market and Melrose Market. Coming off that could be the Melrose Promenade, a vision to improve the walking, bicycling, and public space experience along the eastern side of Interstate 5 on Melrose Avenue. Synthesizing all of this information resulted in a set of general themes and specific design guidelines for each lid section. The guidelines take the form of both strict parameters and suggested features that should be considered by designers, elected officials, and the public. However, a more detailed technical review and rigorous public process will be needed before developing an official plan for the area. A key theme is facilitating neighborhood connections that have been severed for over half a century. The break in the street wall between Downtown and Capitol Hill is a jarring experience for people walking between the two. There is a long pause between any chance of finding welcoming, human-scale places where spontaneous socializing and commerce can happen. Freeway noise, rivers of cars, and exposure to the elements make pedestrians feel vulnerable and isolated. Bringing new low-scale buildings, awnings, trees, and cozy public spaces to the street edges will provide cohesion between neighborhoods and heal the urban scar left by I-5. Another theme is the “pedestrian spine”. 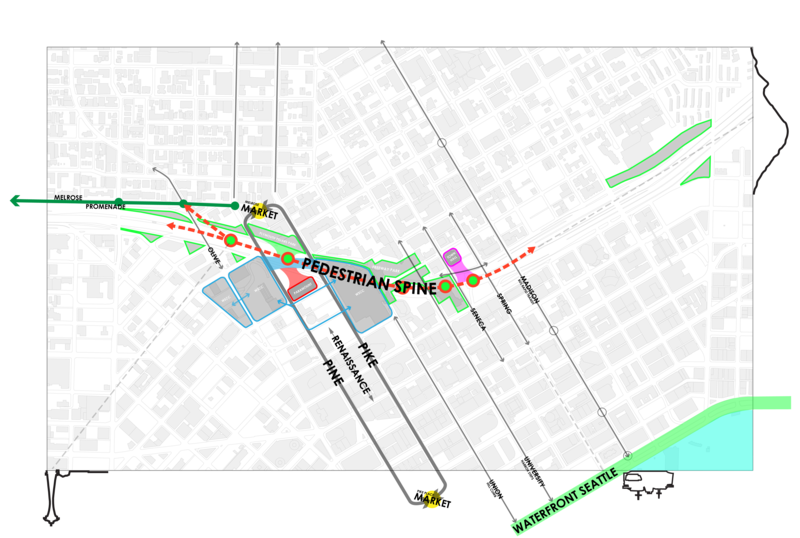 This concept envisions a unified walking experience throughout the series of lids between Madison Street and Olive Way. This spine should have consistent design elements and accessibility, including wide paths, mid-block crosswalks, and, as previously suggested, new ramps for accessing Freeway Park. Such a path would work well both for people walking and people bicycling. The spine theme works in concert with the “emerald chain”: because the lids will be built in phases, each must be an independent park space. Each emerald should shine on its own but work with its neighbors as they are built later on. Section 2A (east side of the Pike Street/Boren Avenue intersection, 0.3 acres): This lid section should be built first because it is small, it can serve as a prototype for the other sections, and it will be timely with the WSCC expansion across the intersection. It can also integrate with the existing Plymouth Pillars Park adjacent to the freeway. Design suggestions include a small plaza, a performance pavilion, and an extension of the neighboring dog park. The intersection itself should be raised to prioritize non-motorized traffic. Section 6 (Madison Street to Spring Street, 1.5 acres): The Spring Street on-ramp must be removed to build a full lid that is flush with the surrounding streets (the alternate ramp is six blocks away at James Street). This lid should primarily be a park space, but retail buildings would be appropriate on the east side to preserve a southerly view towards Mount Rainier and activate 7th Avenue. A combination of hardscapes and softscapes can provide a large, versatile event space. Crosswalks and sidewalks are needed on the four sides where they are missing. Section 5 (Spring Street to Seneca Street, 1.5 acres): The Seneca Street off-ramp will need to be removed to create a more useable and pedestrian-friendly park surface, along with more space for retail buildings (the alternate ramps are at James Street and Madison Street). This section will also need to integrate with the Naramore Fountain on 6th Avenue. Another major design opportunity is to punch through Freeway Park’s old planter boxes on the south side of Seneca Street and transition into a flatter and more useable space on the new lid. Section 3 (Pike Street to Pine Street, 2.5 acres): This lid may may become the crown jewel. It should be developed to fit into the Pike-Pine retail corridor and connect to the Convention Center facilities on either end of it. A pedestrian shopping street is envisioned down its length (see the rendering at the top of this article), with terraced lawns and roof decks along the periphery taking advantage of the slope. A staircase between the Paramount Theatre and Plymouth Pillars Park could create a new pedestrian route away from busy streets. This lid has the potential to attract a wide array of visitors while also becoming a new place for Capitol Hill residents to relax and socialize. Section 1 (Olive Way to Pine Street, 2.6 acres): This area is the the largest and so should be developed last. The steeper slope here is best negotiated with a terraced surface that can be designed with a tight weave of ramps and stairs from top to bottom, facilitating more passive activities and providing a more relaxing park environment. Any commercial activities should be limited to the top tier of the park, which will have a commanding view to the west and which can connect to existing development on the east side of the freeway. The recommended areas for lidding total 8.4 acres, resulting in the earlier cost estimate of $250 million. This bites a significant chunk out of the Center City’s 13 acre open space deficit. Sections 4A and 4B (Freeway Park gaps, total of 1.5 acres): These two gaps in Freeway Park’s coverage should not be developed. Freeway Park has significant historical value in its original design, and it provides a view of the unique University Street ramp and the curving freeway mainline below. More practically, the gaps can likely provide natural tunnel ventilation, negating the need for some of the costly and space-consuming mechanical equipment that may otherwise be needed throughout the study area. Section 2B (west side of the Pine Street/Boren Avenue intersection, 0.1 acre): this area is not a lid candidate because the WSCC expansion will cantilever over the freeway at this location. The latest design iteration proposes retail space and building entries at this corner, which will be a positive change from what is otherwise a desolate pedestrian experience. Secondary north (Olive Way to Denny Way, 4.2 acres) and Secondary south (Madison Street to Yesler Way, 15.5 acres): These secondary areas should only be considered for lidding after the primary study areas are fully developed. They are not in a trench that is easily covered, with retaining walls only on the eastern side. In the south a portion of the freeway is also elevated above city streets. If lids were built with open colonnades on the downhill side the environmental impacts would be substantial. Underneath Freeway Park, for instance, the traffic noise reaches a deafening 85 decibels. Solid walls would be necessary, essentially creating a concrete case. This is likely a costlier proposition that would present little visual improvement unless other measures, like embedding private development into the side of the case, were implemented. But with all of this said, these two areas are quite large and could support a wide variety of park features and private development in the more distant future. People live in cities for the access to other people, jobs, shopping, entertainment, and events that only urban environments can foster. Over the past century that environment has been threatened by a concerted effort to focus less on natural and efficient means of access (that is, walking, bicycling, and transit), and instead make cities more accessible by private automobile. Compared to the rest of North America, Seattle has actually been relatively spared from the most dramatic of effects of auto-oriented planning. The city has even managed to stitch some of the tears in its urban fabric. But a gaping hole still remains in the heart of the city where, over 60 years ago, Interstate 5 sliced off Downtown from the bustling Capitol Hill and First Hill neighborhoods. It’s time to close that gap and refresh the urban experience that draws people and businesses to Seattle. The next step is to form an organization of community members to pressure the City Council and local state legislators to take charge on lid planning. Business leaders, civic figures, neighborhood advocates, and other interested groups must come together as one voice to demonstrate that the status quo is not acceptable. The organization will need to develop a common vision, expand on the interim solutions presented here, and propose an actionable long term strategy. Ultimately, it will be vital to host a open, public process and be transparent about costs and benefits. This could help avoid repeating the 1995 electoral loss of Seattle Commons, a similarly ambitious park proposal that would have made South Lake Union appear much different than it does today. The early signs of such an movement are here. A group of design and development professionals under the name Lid I-5 started meeting in 2010 to discuss feasibility and sketch out lid concepts. However that group is currently idle and is waiting for a political spark. The Pike-Pine Urban Neighborhood Council meets frequently to discuss how the WSCC expansion can give back to its neighbors with good design. The topic of freeway lids has come up as part of the WSCC’s public benefit package and the group is planning to speak to the Seattle City Council at two upcoming events. On December 8 at 9:30am, the Council’s Transportation Committee will hear a report on the WSCC expansion and will take public comment. On December 16 at 12pm will be a “lunch and learn” where members of the public can speak with the Council about lidding the freeway. I plan to attend both events. Architect Chris Patano recently proposed a two-mile long, 45 acre lid stretching north from roughly Pine Street to Lakeview Boulevard. It would be a park integrated with housing, a museum, a hotel, and the sports arena that Seattle and Tukwila are jockeying for. I met Patano earlier this year to discuss the concept, and I find his idea bold and exciting. Of the freeway, he told KING 5, “We might as well contain it and turn it into an asset instead of a detriment”. However, his vision is much more complex than what I am proposing. Patano’s early cost estimate is $800 million ($17.7 million per acre), about four times what I estimate it would cost to lid I-5 just in the downtown core. It’s also located where the freeway is not in a trench, an area I had in my first proposal but later withdrew because of the topographical challenges. Regardless, Patano’s renderings have successfully gained media attention and he is stirring public discussion. This should be capitalized upon to further the conversation. Once a coalition is formed we must start by lobbying the City Council, the mayor, and state legislators for funding to begin the planning and design process. Politics boils down to votes and funding, so there are two key pieces that need to be presented to these decision-makers: 1) demonstration of community support; and 2) an illustration of projected costs and economic benefits. To that end, I have created a Facebook page, an e-mail list, and a new page on this website for interested people to discuss the idea. Whether you support freeway lids now or still have some concerns, sign up to hash out ideas and get updates on this proposal. In the following months I will be seeking partnerships with other local professionals who can provide more of the detailed financing and engineering analyses that are needed. Downtown Seattle and its surrounding neighborhoods are well developed and still growing even more. The time for freeway lids is now, and the price is manageable in the face of overwhelming benefits. We can create the grand central park that Seattle needs while also reducing Interstate 5’s impact on the people, transportation, and built environment of Downtown. Seattle must seize this opportunity to transform the core of its public realm and create a lasting investment in the lives of future generations. Strong leaders are needed, but it begins with a grassroots effort. Let’s begin refining and advocating for this project today to ensure Seattle has an even brighter tomorrow. My thesis document is available online for download: click here (20 MB PDF). Click the button below to signed up for the Friends of Lidding I-5 e-mail list. This entry was posted in Biking, Buses, Cars, Editorial, Land Use, Landscape, Megaprojects, Parks, Public Participation, Public Space, Roads, Transportation, Walking and tagged addition, article, cap, City Council, city planning, cost, Dallas, deck, downtown, e-mail, engineering, estimate, expansion, Facebook, finance, Freeway Park, Friends of Lidding I-5, group, I-5, idea, Interstate 5, Klyde Warren Park, legislature, lid, map, money, picture, plan, post, proposal, rendering, Scott Bonjukian, Seattle, structure, The Northwest Urbanist, thesis, traffic, transportation, update, urban design, urban planning, walking, Washington state, Washington State Convention Center, WSCC, WSDOT. Bookmark the permalink. Fantastic work Scott! Have you considered adding a public rock climbing structure in one of the lid parks? Chicago has a terrific example in Maggie Daley park. With the tremendous growth of the climbing community in the Seattle area, I think it would be a great way to commercialize the park and bring some revenue for its maintenance just as the boat rentals at Green Lake do. Keep up the awesome work, I’m excited to see a Seattle that takes I-5 and turns it into something beautiful and positive. Rock climbing?! That sounds awesome. If it was outdoors like the example you cited it could be the extreme, hardy version of the REI climbing wall nearby. I think we would be obligated to put a Starbucks on top, of course. Take a look at the space between the NE 45th overpass and the NE 50th overpass between the University District and Wallingford. It seems this would be a very easy space to lid. It would provide transportation options across the lid. If the ambient environmental issues with building over a freeway could be solved, it would be a place to put a mixed-income housing development. I suspect the cost of a lid that carries houses and vehicles would be different from a lid that just supports a park and an east-west street or bicycle track. Hi Mike – I’ve heard that idea floated quite a lot by other locals, and it’s definitely something worth looking into. It may be something I could cover in a future post. Interesting that artists’ renderings of urban development plans always try to enhance the proposals’ appeal by showing people walking around in warm weather under a blue sky. Must be nice to live in a fantasy. Guilty as charged – it’s certainly easier to make rosy, clear skies renderings, but I’ll be the first to admit it needs some more overcast and some light mist. I have to disagree about funding sources – there are a stunning variety of public sector sources, including at the city, state, and federal levels. We only need to look at recent lid projects like in Dallas and our own Freeway Park to see how majority public funding led to parks. But yes, there will be an inevitable question of private development. My position will always be to prioritize park space, and that any commercial development should be limited in scale and secondary. Yeah- thanks for that- it saved me reading any further. Sadly, this hare-brained scheme will probably fly with Seattle voters. Can you explain how you got the 44 needed acres for the Downtown Urban Center? It doesn’t appear to be the total of the needed acres for the 5 neighborhoods. Likewise for the total existing Center City acreage, it doesn’t appear to be the total of each of the four urban centers. Are you including an adjustment for jobs that would explain the difference?